Crazy as it might sound, the Buckeyes haven't lost a football game in East Lansing in 19 years. Nineteen. The dial-up internet hissing and popping sounds era, when spooky, inexplicable and paranormal phenomena were the norm. The Y2K glitch was going to be the end of the world, but Ty Willingham winning the Pac Ten and taking four-loss Stanford to the Rose Bowl was totally fine and normal. I remember this insanity vividly. Up was down, right was left, the Buckeyes didn't go bowling that season and it wasn't because of an NCAA ban levied against the program for running a lurid trinket cartel; it was because the team was so bad at football that it didn't qualify. Crazy isn't a strong enough word to describe the waning moments of the 20th century. Back then Ohio State not only had a fullback on its roster, he was a captain. His team left Spartan Stadium with an L and lost five other games to keep them free of holiday travel. This Saturday marks the seventh trip back up to Willingham's alma mater since we stared down the tech apocalypse, defeated it and lived to see this goldenest era of Buckeye football. Spooky, inexplicable and paranormal. That's Purdue, and Sparty isn't Purdue. Let's get Situational! 11. This Buckeye team's uneven play is beginning to rival the Y2K glitch for fostering anxiety about the world ending. Saturday's inauspicious performance led to a spike in canned good sales across Ohio, with two Michigans still left on the schedule. After a week off, Ohio State allowed Nebraska to march right down the field for an opening touchdown. The home team then went 4-and-out on its first shot and it was as if Purdue Harbor simply resumed from where it left off in West Lafayette. K.J. Hill decided to have a very un-K.J. Hill game. Mike Weber fumbled, twice. The defense, per usual, was gashed. Dwayne Haskins attempting to...slide? Not sure. Even Dwayne Haskins was off while wearing a scarlet jersey, for the first time since his garbage time monsoon appearance against Illinois last season when he gave the Illini defense its first points and ultimately got benched. It wasn't the shiny performance we wanted after two weeks off or following a blowout loss. But eventually the Buckeyes flexed, the offensive line began to exert its will, the penalty flags stopped flying toward them and team began to look like a talented unit with a modicum of discipline. Those 252 passing yards Haskins had in his uninspiring performance - his weakest output to date - matched Braxton Miller's career high, by the way. 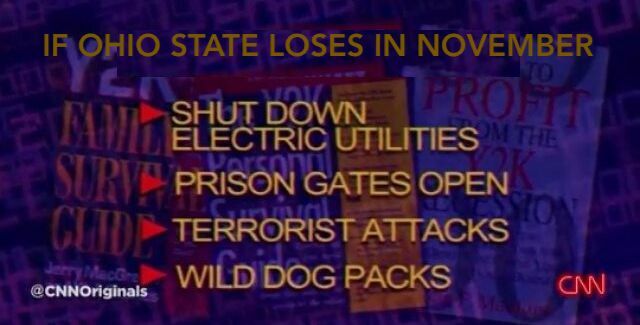 Y2K was overblown. It's this 2018 team that's going to end civilization. WILD DOG PACKS. 10. Aristotle was famous for droning endlessly about the importance of 2nd half adjustments to anyone who would listen to him, mostly Grecians. Thing is, he wasn't wrong. The Buckeyes are 4-1 in 2nd halves which is a major reason why they're 4-1 in conference play. During 1st halves they've been conspicuously clunky on the field while the sideline and coaching booth collects data, which really encapsulates the frustration with this team. Opponents come out each Saturday with a scheme designed to challenge the Buckeyes' tendencies, while the Buckeyes counter with...precisely those tendencies. Ohio State then assesses the situation, adjusts accordingly and wins despite the clunkiness, one exception noted. Aristotle was a tutor to child named Alexander the Great. Alex grew up and never lost out of conference. People forget that. Second half adjustments are everything. 9. L.D. Scott is Louisville's DL coach. Ryan Beard is Louisville's LB coach. One thing they both have in common is they can call their boss dad since both men are married to the head coach's daughters. Anyway, Louisville has given up 237 points over the past four (!) games and the guy in charge of the program has two sons-in-law running the front seven. The Cardinals' defense is a sweltering 124th in the FBS. 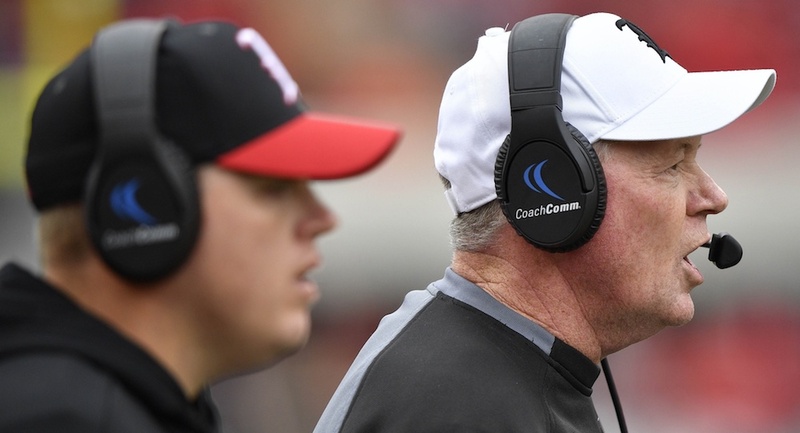 Sure, Bobby Petrino's non-relative and DC Brian Van Gorder is a case study in how serially bad coaches keep getting hired despite their track record, but Van Gorder is easy to launch into sun. At this point he's probably flame retardant and prepared for it. But sons L.D and Ryan? Man, that's awkward. At this point we should mention that Louisville's QB coach is named Nick Petrino, which if you squint looks like Jay Paterno and the whole point of bringing this up is that hiring friends and relatives - and literally three sons - has teeny tiny upside but an avalanche of downside. (Ohio State) is Davis' first-ever college coaching job. ...that there's no better place to learn the ropes than Columbus. 8. Brendon White had himself a game. His performance carried nostalgic pinches of Vonn Bell seeing the field toward the end of 2013 following months of opposing teams successfully picking on poor Corey "Pittsburgh" Brown. Jordan Fuller, penalized for trying to be safe. White got his shot after Jordan Fuller was ejected, and while it's easy to suggest old stubborn coaches played favorites and kept a playmaker off the field until they were forced into using him, it's easier to say that Ohio State fans are allowed to have nice things. Like, a second versatile safety to pair with Fuller when he returns this weekend - and then in every game after that, for example. In a season where improvement has been hard to come by, perhaps the Buckeyes' star performer against the Huskers has been climbing all season to reach this moment. There's your improvement. Someone other than Brian Hartline is coaching players up in 2018. Hello, Mr. Grinch. It's the textbook itself. Time to rewrite the targeting guidelines through a prism of sanity. ...multiple times during a single game. If you're a spectator on your couch, that's annoying! But allow me to capture for the couch dwellers how this cadence goes when you're inside the stadium, blissfully unaware of all of the J.D. Power awards Chevy has won over the past three years. In the closing moments of the 2nd quarter, while animated, luminescent McDonald's logos danced around the electronic ribbon on B-Deck, audible plugs for multiple companies were delivered from the stadium announcer. Between the static ads, the electronic ads and the audible plugs - there were no fewer than a dozen commercials happening all at once inside Ohio Stadium, while players and coaches awkwardly stood around waiting to be allowed to resume play. That eventually happened, but then replay booth officials decided to review (an obvious) Nebraska completion. This break produced a Tansky Toyota t-shirt launch into the north end zone, which was followed by a restaurant commercial, a non-revenue sports ad and then an Ohio State commercial. Nebraska got credit for the catch, which was inevitable. Over a ten-minute span there were exactly two plays of live football while TV breaks and booth reviews dominated the action. Nebraska then scored, which was when those of you at home got Chevy'd both before and after the ensuing kickoff. The rest of us got a bunch of noise, none of which included the Ohio State marching band, which was busy preparing for a halftime they don't show on television. The face value for a ticket to this spectacle: $102. College football's attendance is declining across the country, and so is Ohio State's. Weird. They should do some research and find out why that's happening. There is a bourbon for every situation. Sometimes the spirits and the events overlap, which means that where bourbon is concerned there can be more than one worthy choice. Ramzy, you discuss a lot of bourbons that are for all intents and purposes impossible to get one's hands on... I'm curious, how do you go about procuring these gems? Do you treat yourself to expensive pours at bourbon bars or do you have an "in" in the distillery business that allows you to own some of these bottles? Old Fo 1897 @ Dubgate 8: Good and Plenty. I replied with something to the effect that Ohio's stringent liquor distribution practices aren't helpful for the natives, but the exchange gave me an idea for what to bring to the Eleven Dubgate 8. Originally I was going to pack a tasty bourbon with me to share with our guests, but decided to conduct an experiment instead. Twenty minutes after landing at CMH on Friday I found myself at the Giant Eagle not far from the airport, evaluating several shelves of reputable if not excellent bourbons, including Old Forester 1920, which is superior to its worthy cousin pictured to the right (being photobombed by one of Walt's masterpieces that we all autographed for Calpoppy as a backdrop) (mend quickly, Calpoppy). Over the course of the weekend I popped into another supermarket and a liquor store and found far more premium options than I had been led to believe would be available. Compensation shapes behavior, and as bourbon continues its skyrocketing popularity it is inevitable that availability is going to continue to expand. I saw Colonel Taylor products (albeit not the Four Grain I reviewed last week) in more than one place, and that Giant Eagle actually had Weller products for sale at the respectable, non-arbitrage retail price. 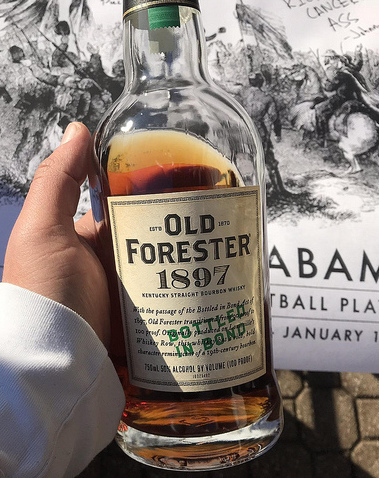 As for Old Fo 1897 - named for the year that Bottled-in-Bond legislation was passed to discourage scammers from selling turpentine and tobacco spit as whiskey - it was drained at the Dubgate in about an hour at $5 per pour and every dollar went to charity. If you've never had 1897 before, it's like chewing up a caramel-coated plum with a hint of cayenne. If you want to try it yourself, head to Giant Eagle. It's shelf was only missing one bottle when I left. The Michigan State–Ohio State football rivalry is an American college football rivalry between the Michigan State Spartans and Ohio State Buckeyes. Not to be confused with Michigan–Ohio State football rivalry. Oh, cool. Thanks for clearing that up. Three teams averaged zero-point-something yards per carry in a single weekend, and it looks like Tennessee played an NBA team? Also, there are exactly zero college football defenses that are Less Than One Yard Per Carry good at defending the run. Sparty has the nation's top rush defense and it allows 2.53 per. Hey, that's Ohio State's music! He is from, knows and has recruited all over the midwest. Sorry, I just got lightheaded. Wow, Chevy really has won a lot of J.D. Power awards. 1. The current Spartans, victors of two straight college football games, are riding their longest winning streak of the season. They have not won three straight yet - and this weekend can clinch that they won't. MSU lost in Columbus by 45 points only a year ago. Last week it willed its way to 87 passing yards against a broken Maryland team and played like it just wanted to run out the clock the moment the game started. If that smells familiar, it should - squeezing any joy out of watching football is one of the most popular recipes in the Jim Bollman cookbook. Terry McLaurin's blocking has been superb this season. The Buckeyes pasted Sparty last season while rushing for 335 yards, averaging 8 per carry. The weak spot for the eventual B1G and Cotton Bowl champions was its record-breaking QB, who was always hesitant to throw the ball at a receiving unit that underachieved throughout the final three seasons of his eligibility, which happened to coincide with the final three season's of Meyer's biggest hiring error not named Beck or Davis. Ohio State finally broke out of its ground game funk last weekend, rushing for over five yards per carry which suggests that coaches have finally troubleshooted the reason their car wouldn't start ever since offenses figured out that the guy in the GIF further up on the page awkwardly sliding and conceding no fewer than five extra yards wasn't - to put it conservatively - much of a threat to run himself. It's been a slog since camp began under Zach Smith storm clouds, and this is one of those games Meyer circles every season - no matter what Wikipedia says about the broader history. Nobody comes to Ohio State to play in the Indiana or Purdue game (which, well - it shows) but Michigan State has challenged for B1G supremacy since every player on the Buckeyes' roster was lucid enough to follow the sport they now play. They may not remember what happened 19 years ago in East Lansing at the height of Y2K hysteria, and they definitely don't want to make any new memories like that. The emergence of a viable second safety, a clean 2nd half with the refs and an OL finally coalescing around an angry rushing attack leave me no choice but to be bullish about the Buckeyes this Saturday. It also feels better than buying up canned goods in preparation for the apocalypse. Thanks for getting Situational today. Go Bucks. Beat Michigan State.